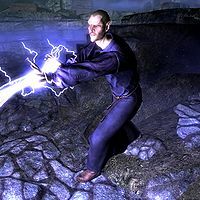 Vaermina Devotees are worshippers of the Daedric Prince Vaermina. They reside in Nightcaller Temple protecting the Skull of Corruption. However, when an Orc war party attacked the temple they released the Miasma, a gas that put everybody to sleep. After Erandur unsealed the temple so he could destroy the Skull of Corruption, the Miasma lifted and the Orcs and devotees began to reawaken. The devotees wear Vaermina robes and a pair of boots. They carry a leveled potion of restore magicka and one sample of a common-type ingredient. This page was last modified on 15 November 2016, at 20:11.